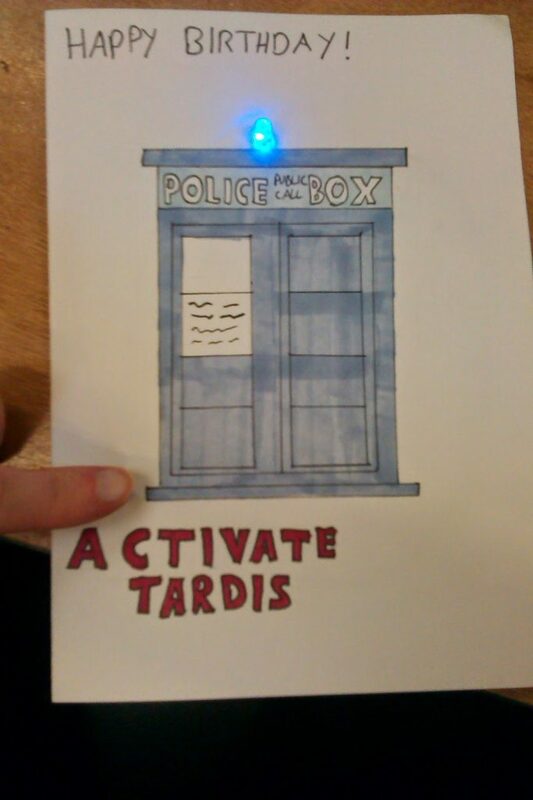 For a recent HackSpace I was working on the revised design of my TARDIS birthday card. The original version used conductive paint however that give spotty performance so this time I just soldered the components together with wires. When you hold down the button the blue led that’s the TARDIS light flashes. I also continued work on my Cylon circuit having got it to work on a bread board the previous week. The aim of this is to have a 70s style Battlestar Galacita Cylon Centurion helmet painted on a t-shirt, with the eye scanning left and right comprised of 11 red LEDs. I began soldering onto it the stripboard having worked out the intended layout.